RFID Journal - RFID (Radio Frequency Identification) Technology News & Features. In one of its latest forays into technology, Intermountain Healthcare [Salt Lake City] has implemented an RFID system to improve the speed and accuracy of laboratory testing. In 2008, the Salt Lake City, Utah-based provider was cited in the annual Hospitals & Health Networks' Most Wired study as being one of the nation's most technology-savvy health-care organizations. It marked the ninth time in 10 years that the survey— a joint project of Hospital & Health Networks, Accenture, McKesson, the American Hospital Association and the College of Healthcare Information Management Executives—ranked Intermountain Healthcare among the nation's most wired organizations. Implanet Using IBM Software to Protect Patients in the Event of Medical Device Recalls | Reuters . Implanet, a manufacturer of implantable medical devices, has selected IBM (NYSE: IBM) sensor technology as the foundation for BeepN'Track, a new service that traces the movement of Implanet's products - including knee and hip implants - across its supply chain to hospitals. Story on ComputerWorld Mobile & Wireless. These robots are provided by Aethon Inc. and use Cisco networking, VPN and wireless products to provide navigation and communication support. The robots can even use the wireless network to call for an elevator to speed its delivery. By using the robots, Dillehunt [CIO at FirstHealth Moore Regional Hospital in Pinehurst, N.C] is able to keep his Wi-Fi network free of constant radio traffic from RFID tags on hundreds of devices, he said. "I needed a system to keep RFID from flooding my regular Wi-Fi network," he noted. Wi-Fi Real Time Location Systems (RTLS): a possible substitute for RFID? Given that many companies already have Wi-Fi networks, Wi-Fi Real Time Location Systems (RTLS) may be a cheaper alternative to some more expensive radio frequency identification (RFID) technology applications, according to one analyst. The analyst cited is Stan Schatt, vice-president and research director of ABI Research. By using Wi-Fi RTLS, companies can leverage their existing Wi-Fi network, although they might have to add access points to provide complete coverage. The advantage is that RFID readers are expensive, and Wi-Fi RTLS is an open standard so that the company needn't invest in proprietary equipment. With Wi-Fi RTLS, you also have the bonus of being able to integrate this location system in to an existing Wi-Fi network. You avoid having to install and manage a separate network. The downside is that Wi-Fi RTLS doesn't have the accuracy of RFID. This article gives the example of tracking palettes on a loading dock. Wi-Fi RTLS wouldn't work well with tracking individual packages on palettes, since its accuracy is limited to within one foot. Another imperfect application of Wi-Fi RTLS is in wide-open spaces that present a lot of interference like the outdoors or in large warehouses in which the signal would bounce of walls and other objects, said Schatt. However, you don't have this problem with 802.11n, which is the first 802.11 standard to support multiple-input multiple-output (MIMO). Inf fact, 802.11n requires MIMO to work optimally. What MIMO does is to allow multiple antennas at the transmitter and receiver so that the multiple signals created by bouncing off different objects can be collected and use to transmit data while increasing throughput and link range without additional bandwidth or transmit power. Computer security expert Bruce Schneier took a swipe at a number of sacred cows of security including RFID tags, national ID cards and public CCTV security cameras in his keynote address to Linux.conf.au this morning. These technologies were all examples of security products tailored to provide the perception of security rather than tackling actual security risks, he said. His main beef is that he feels that public discussion is tainted with commercial and political self-interests (hmmm...sound likes health care) that may obscure the best workable solution. The best security solution will fail if it doesn't cater to both the reality and perceptions to do with security, Schneier warned. So when you undo your belt buckle and take off your shoes at airport TSA checkpoint, it's partly to make you feel safe? They're discussing this on Slashdot, where I first saw this story. This story reported on the RFID Solutions Online Web site talks about the Encentuate healthcare identity and access management (IAM) system that "automates access to web, desktop and legacy applications, using a combination of single sign-on and employee RFID badges for strong authentication." InnerWireless, Inc., the leading provider of in-building wireless solutions, announced that its PanGo real-time location system (RTLS) has been deployed by the University of Maryland Medical Center's Radiation Oncology Department to track approximately 600 patient charts within their building and across the entire downtown campus. By leveraging its existing Cisco Wireless Network and Cisco Wireless Location Appliance to incorporate PanGo, Radiation Oncology will become the first department in the University of Maryland Medical Center to use RTLS. WWT (World Wide Technology) and AeroScout have partnered to configure, install, train and support a Wi-Fi-based asset tracking and location solution at Providence’s Centralia location. PH&S is a 27 hospital, 46,000 employee system which operates in Alaska, Washington, Montana, Oregon and California. DELRAY BEACH, FL – September 9, 2007 – VeriChip Corporation (NASDAQ: CHIP), a provider of RFID systems for healthcare and patient-related needs, announced today that it is scheduled to appear in an exclusive recorded interview on ABC's Good Morning America tomorrow, September 10th, between 7 a.m. and 8 a.m. eastern time. The show airs on the ABC Network from 7 a.m. to 9 a.m. eastern time. I don't know what they could say that they haven't said already, but since even the WSJ hasn't picked up this story yet, it could be a way of making their case before the general public hears about the AP story. UPDATE: I see they have a press release addressing the concerns mentioned in the AP story. 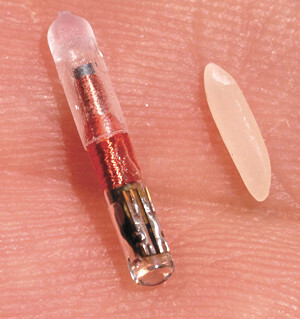 It points to two studies the don't show evidence of tumorigenesis associated with RFID implants. There's one I've already listed in a previous post by Rao et al, which didn't find evidence of neoplastic tissue in over two-years time, and anther study, by Ball, et al: Lab Anim Sci. 1991 Apr;41(2):185-6. Evaluation of a microchip implant system used for animal identification in rats. Ball DJ, Argentieri G, Krause R, Lipinski M, Robison RL, Stoll RE, Visscher GE. Sandoz Research Institute, East Hanover, NJ 07936. The abstract is not provided so I'll have to take their word that the results were negative for tumor formation. They mention the single case report of the dog with the tumor at the implant site which they say is unsubstantiated. Again, this is cited in my previous post. It asserts that lab mice and rats are susceptible to tumors at injection sites, no matter what the material injected. VeriChip asked a 30-year veterinary expert, Dr. Lawrence McGill, to submit to an interview by the AP reporter, who they claim didn't include statements by the expert in this story. "The Company now intends to retain Dr. McGill as an expert to assist in the review process of this article and the studies referenced therein." They end by saying, "We will retain independent scientists and researchers to review the content, veracity and credibility of the studies alluded to in the article." 1. VeriChip is safe and has been cleared by the FDA as a Class II Medical Device. This is a single report from 2006. "A 9-year-old, male French Bulldog was examined for a subcutaneous mass located at the site of a microchip implant." The mass was determined to be a high-grade infiltrative fibrosarcoma. The entire citation and abstract is in the extended post. Below are four abstracts related to tumors in mice and rats (one study was negative for tumors) associated with microchip implantation. The full citations and abstracts are listed in the extended post. The first is a study from 1997, which was studying parental preceptual x-ray and chemical carcinogen exposure on around 4300 mice. Tumor nodules encasing the chip were seen in 36 mice. "Microscopically, soft tissue tumours such as fibrosarcoma and malignant fibrous histiocytoma were detected." The next is a study from 1999, looking at a short-term method for chemical carcinogenicy . "Microscopic examination of all implant sites revealed that 18 of 177 animals had a subcutaneous histologically malignant sarcoma." "An unusual preneoplastic mesenchymal change characterized by the term 'mesenchymal dysplasia' was present in most groups and was considered to be a prodromal change to sarcoma development." The third from 1990, looked at the tissue stability and reaction to microchip implants in 140 mice. No tumors were found. "Neoplastic changes were not observed in the tissue around the glass-sealed devices with polypropylene cap for up to 24 months." A fourth, from two separate chronic toxicity/oncogenicity studies. "The tumors occurred at a low incidence rate (approximately 1 percent), but did result in the early sacrifice of most affected animals, due to tumor size and occasional metastases." "All were mesenchymal in origin and consisted of the following types, listed in order of frequency: malignant schwannoma, fibrosarcoma, anaplastic sarcoma, and histiocytic sarcoma." Dr. George Demetri, director of the Center for Sarcoma and Bone Oncology at the Dana-Farber Cancer Institute in Boston, agreed that there was cause for concern. Dr. Oded Foreman, a forensic pathologist at the Jackson Laboratory in Maine, and an authority in mouse genetics research and the initiation of cancer, said after reviewing the animal studies, there "might be a hint something real is happening here." A veterinary pathologist and oncology specialist also expressed the consensus view that more research needed to be done both on dogs and non-human primates, perhaps lasting for as long as for 20 years. The raises the question of why the initial studies were not released to those choosing to have a chip implanted.